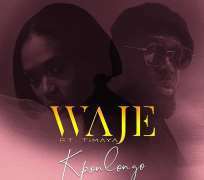 Award-winning singer and songwriter Waje releases ’Kpolongo’, a dancehall tune featuring Timaya. The new single off her forthcoming EP is produced by Micon and invites us briefly into the world of the singer and her lover. Kpolongo, which means 'loud', tells the story of two lovers who are not afraid to express how they feel about each other in the best way they know how - dance. In the song, Waje declares to her lover "Oh oo... no be every day I dey see bobo wey dey come correct....." and in response, Timaya sings ..."I will never do you wrong e, I will treat you with care.....". The song paints a visual story of two people who meet on the dancefloor and enjoy moving to the beat of their hearts and the music. It is loud, as the song portrays, but it is also a private moment shared. As usual, Waje’s vocals are impeccable. Even with the dancehall rhythm, we can still appreciate the intimacy of the song as she harmonizes with Timaya. The single has the potential to be enjoyed either at the club, a party or even just when you need an upbeat pick-me-up.